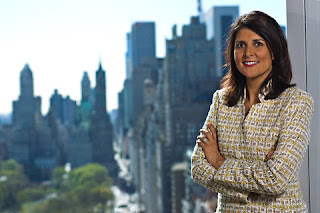 Nikki Haley visiting New York during her ongoing national fundraising tour. The number of South Carolinians who identify themselves as members of the tea party has fallen to less than 6 percent, and Gov. Nikki Haley’s approval ratings are lower than President Barack Obama’s, according to a poll of state residents released Wednesday. The survey, taken Nov. 25 through Dec. 2 by Winthrop University, found that 5.7 percent of registered voters said they were members of the tea party, with 90.8 percent saying they weren’t. The poll also showed that 48 percent of South Carolina residents approved of the job Obama is doing, while 38.3 percent approved of the way Haley is handling her job.